When Pope Francis announced his first slate of appointments to the College of Cardinals early last year, much of the commentary in both the Catholic press and mainstream media focused on his apparent intent to “de-Italianize” or “de-Europeanize” the upper echelons of the Church’s hierarchy. Bishops from prestigious Italian dioceses and traditional “cardinal sees” were passed over in favor of prelates from countries like Haiti that had never before had a cardinal of their own. The recipients of Francis’ second round of red hats, which were officially handed out last Saturday in a ceremony at the Vatican known as a consistory, seem to offer further confirmation of the pope’s desire to boost the number of cardinals hailing from “the peripheries,” places like Africa, Asia, and South America where Catholicism is growing but which are still dramatically underrepresented in the highest ranks of Church government. Archbishop Soane Patita Paini Mafi, the first cardinal to hail from the tiny Pacific island nation of Tonga, claimed in an interview that his only previous conversation with the pope consisted of him explaining where Tonga is located. It is undeniable that the College of Cardinals is becoming more geographically diverse. But is it necessarily the case that the so-called peripheries are becoming less underrepresented? After the consistory last February, I raised the possibility that the Catholic population of the “global South” was growing more quickly than the number of cardinals from these regions, meaning that the disproportionate influence of European prelates within the Vatican bureaucracy – and over the process of electing the next pope – was in fact growing stronger. Around the time of the 2013 conclave, the Pew Research Center produced a helpful graphic that showed the share of cardinal electors coming from each continent, as well as each continent’s share of the worldwide Catholic population. Though Europe accounted for less than a quarter of the world’s Catholics in 2013, over half of the cardinals eligible to vote in the conclave that elected Francis were European; only 17% of the electors came from Latin America, which is home to nearly 40% of Catholics. The Church is not a democracy, so saying that certain areas are “underrepresented” should not be interpreted in a narrow political sense or taken to mean that the current arrangement is necessarily unjust. But there are nevertheless good reasons why a geographic imbalance in the College of Cardinals ought to be corrected. The Church is a global institution whose leadership should not allow itself to become consumed with provincial concerns. To his credit, Pope Francis seems well aware of the need to steer clear of such pitfalls, and his pronouncements on issues like climate change reflect a global perspective that stands in clear contrast to that of his many Western critics. Anyway, I was interested to see whether this latest move will have an appreciable impact on the representativeness of the cardinalate, so I fired up my copy of Stata 12 (alas, I can’t afford Stata 13) and got to work. For those of you who weren’t yet loyal RM readers a year ago, here’s a quick recap of the approach I laid out last February (much of this description is lifted verbatim from that earlier post). For data on the nationalities of cardinals and the dates of their births, deaths, and appointments, I turned to “The Cardinals of the Holy Roman Church,” a wonderfully comprehensive website curated by Florida International University’s Salvador Miranda. Since the majority of Catholics lived in Europe for most of the Church’s history, and since the cardinals were almost all of Italian descent until relatively recently, I decided it would be sufficient to begin my analysis around 1900 (this was also the earliest date for which I could find estimates of the global Catholic population, as I explain below). I pulled information from Miranda’s website going far enough back in time to be sure that I had included all men who were cardinals at the start of the twentieth century. Counting cardinals at any given point in time is in fact a bit trickier than it might seem. Cardinals can exit the College either by dying, by being elected pope, or (in a couple rare instances) by resigning their position. The pope can also create “secret cardinals” or cardinals in pectore, whose names are kept “in his breast” until such time as he decides to announce them. Although the date of promotion of such cardinals is technically the date the pope promoted other cardinals he chose at the same time, I figured it would make more sense to count only cardinals whose names were known publicly on the date in question. Although the Gini coefficient is constantly in flux as older cardinals pass away and/or as the world population of Catholics changes, I obviously had to limit myself to calculating it at a finite number of points in time. I chose to do so at the times of the consistories when new cardinals are inducted, and at the times of the conclaves when new popes are elected. Because I only have population data at select dates, I used simple linear interpolations to estimate population at the times of the consistories and conclaves (i.e. if population data were available at time t and time t+1, I assumed that population growth between t and t+1 could be modeled with a straight line). Following the promulgation of Pope Paul VI’s apostolic constitution Romano Pontifici Eligendo in 1975, only cardinals under the age of 80 are permitted to cast votes for pope. 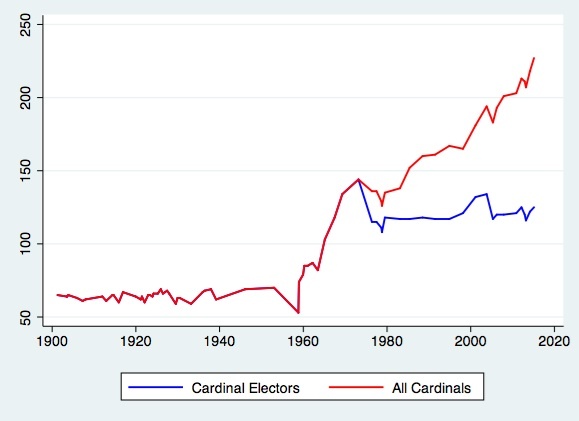 Since their right to vote is the primary (but by no means only) reason we are interested in their nationalities, I do my analysis in the post-1975 period on both the entire set of cardinals and on a restricted sample of the sub-octogenarians. Fig. 1 illustrates how the size of the College has increased dramatically since 1900, even as the number of eligible electors has remained relatively constant in recent years (owing to a decree of Pope John Paul II that no more than 120 cardinals may cast ballots in conclave). In fact, the rate of growth of the number of cardinals seems to have accelerated since the early 2000’s, perhaps reflecting increased life expectancies. Fig. 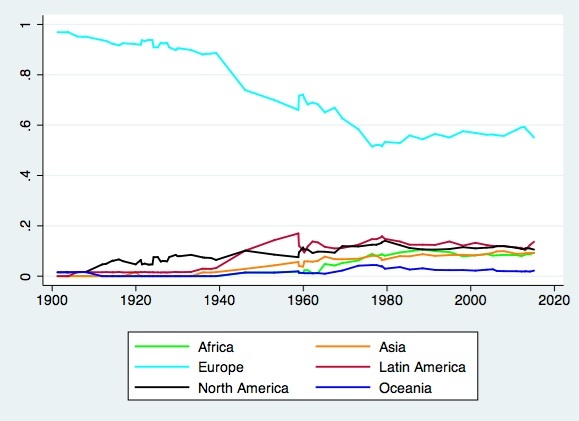 2 shows how the percentage of cardinals hailing from each continent has evolved over time. While Europeans have lost a lot of ground compared to the early twentieth century, the absolute share of European cardinals has remained roughly constant for the last thirty years or so (though it appears to be ticking downward once again). Fig. 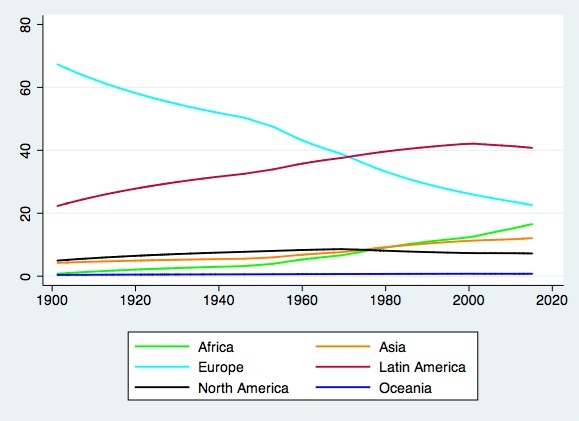 3 plots the population series I constructed from the WCD data, and gives a rough idea of how the Catholic populations of different parts of the world have changed in the last hundred-odd years. A comparison of Figs. 2 and 3 makes it abundantly clear that representation of the non-European continents in the College has not tracked their shares of the worldwide population of Catholics. Finally, Fig. 4 presents the estimated Gini coefficients for the College of Cardinals from 1900 to the present. The solid lines denote computations using historical data, while the dashed lines indicate projections for 2020 based on the estimated future Catholic populations of each continent in the WCD data and the assumption that shares of cardinals from each continent will remain at their current levels going forward. The pattern remains quite similar to what I found last February, and runs somewhat counter to the conventional wisdom. The lines drop off sharply at the very end of the series, indicating that Francis’ recent set of picks is indeed moving the College toward geographic equity (the coefficient for all cardinals decreased from 0.278 on Feb. 22nd, 2014 to 0.262 today, and the coefficient for all electors decreased from 0.216 to 0.157). But the projections for 2020 should give pause to anyone claiming that European overrepresentation is coming to an end. If each continent’s current share of the College is maintained, the Gini coefficient will actually rise modestly over the next few years – to 0.281 for all cardinals and 0.174 for the electors. 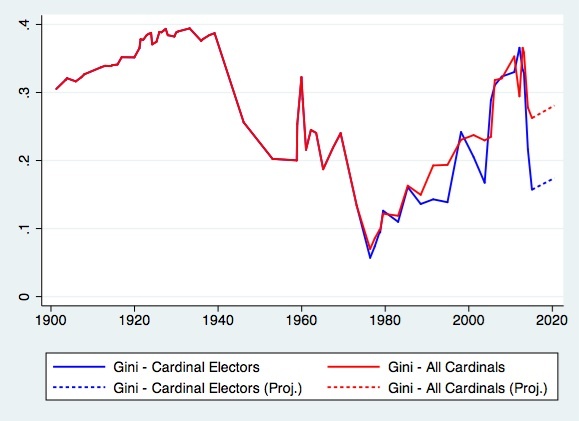 Yet this is an improvement from last year’s projections for 2020, when I forecast that the Gini coefficient would rise to 0.300 for all cardinals and 0.237 for the electors. Looked at another way, the predicted 2020 Gini for the electors is 25% lower than it was a year ago. Good work, Francis! Some reports have claimed that Francis is considering lifting the cap on the number of eligible electors from 120 to 140, presumably out of a recognition that meaningful improvements in the geographic representativeness of the College will not be brought about through attrition alone. In fact, there are already more than 120 cardinals who would be eligible to vote for pope were a conclave to be held today, so perhaps Francis can just continue to flout the official rule without explicitly changing it (he is the pope after all!). The above analysis suggests that such aggressive measures will likely be needed if the College is to become more representative in the face of continued growth in the Catholic population of the global South. *Especially geeky readers interested in the technical details of how the Gini coefficient is computed can check out page 9 of a working paper entitled “How Has the Literature on Gini’s Index Evolved in the Past 80 Years?” by Kuan Xu of the Dalhousie University Department of Economics in Nova Scotia for a lucid, step-by-step derivation. This entry was tagged Cardinals, Catholicism, Pope Francis, Religion. Bookmark the permalink.